Preface (P. Angeli, U. Gulini, W. Quaglia). Bernard Belleau: Medicinal Chemist. 1925-1989 (D.J. Triggle). Design, anti-HIV activity, cellular pharmacology and conformation of BCH-189 [(±)3TC], a novel nucleoside analogue (B. Belleau, et al.). Theoretical and practical advantages and limitations of techniques used in functional pharmacological classification of drug receptors (T.P. Kenakin, R.A Bond). Is pharmacological analysis of agonist action useful in medical chemistry? (P. Leff, I.G. Dougall). The hydrogen bonding of drugs: its experimental determination and role in pharmacokinetics and pharmacodynamics (B. Testa, et al.). Presynaptic receptors modulating transmitter release: physiological and pharmacological aspects (M. Raiteri, et al.). Presynaptic auto- and hetero-receptors in the cholinergic regulation of pain (C. Ghelardini, et al.). Heterogeneity of &agr;2-adrenoceptors: clinical aspects (E.S. Vizi, et al.). Histamine H3 receptors: novel ligands and responses (J.C. Schwartz, et al.). Selective alpha adrenergic agents - Differentiation of receptor subtypes (J.F. DeBernardis, D.J. Kerkman). Stereoisomeric, photoaffinity, affinity and fluorescent probes for characterization of dopamine D1 and D2 receptors (J.L. Neumeyer, et al.). Serotonin receptors, 5-HT ligands and receptor modeling (R.A. Glennon, R.B Westkaemper). Excitatory amino acid receptors: multiplicity and ligand specificity of the NMDA and AMPA receptor subtypes (P. Krogsgaard-Larsen, et al.). Tricyclic compounds as selective muscarinic antagonists: structure activity relationships and therapeutic implications (W.G. Eberlein, et al.). Design of high efficacy agonists at cortical muscarinic receptors (J. Saunders). Multidisciplinary analysis of muscarinic receptors in guinea-pig isolated ileum, atria and uterus in vitro (R.M. Eglen, et al.). Molecular biology of the GABAA receptor (A.N. Bateson). Potassium channel openers: pharmacology and therapeutic prospects (U. Quast, et al.). L-type calcium channels and calcium channel ligands (J. Striessnig, H. Glossmann). Central cholecystokinin receptors : opportunity for drug discovery (G. Gaviraghi, et al.). Drug modeling at cell membrane receptors: the concept of pseudoreceptors (J.P. Snyder, et al.). Concluding comments (D.J. Triggle). Messengers and modulators - Receptors and enzymes (E.J. Ariëns). Author index. Subject index. The 8th Camerino-Noordwijkerhout Symposium has continued along its traditional path of interdisciplinary cooperation. Chemists, biochemists, pharmacologists, biophysicists and physiologists are all involved in the task of improving our knowledge of the mechanisms of drug-receptor interaction and of the heterogeneous nature of biological molecules. 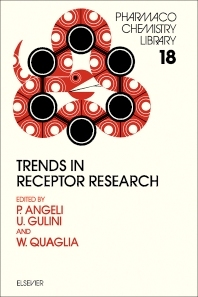 In this volume, leading researchers have contributed state of the art information on receptor chemistry. Newest developments are covered with particular reference to receptors of the nervous system; SAR studies; receptor isolation; receptor cloning; receptor topography; biomedical consequences of occupancy; receptor regulation and receptor theory. This will be of great interest to pharmacologists, biochemists and medicinal chemists, as well as a valuable source of reference for medical students and postgraduate students in related fields.